Cauliflower is having a good year. After years of neglect, cauliflower steaks are all the rage. Roasted cauliflower florets with golden raisins are popular too. And now, here is a really delicious soup to round out your cauliflower consumption. I love it. It’s my first successful puréed soup! 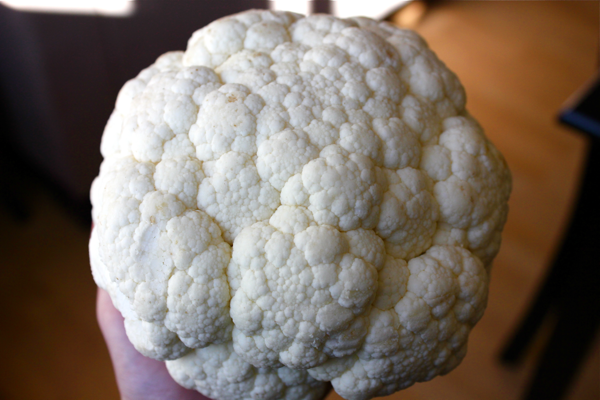 I got a beautiful cauliflower in my vegetable delivery. I wish I hadn’t put it all into the soup because it was so sweet. I could only nibble on the little pieces that stuck to my cutting board. 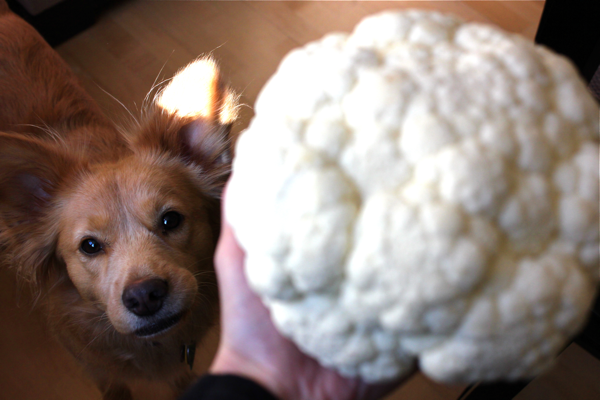 This cauliflower was the first one Stella had ever seen, and she showed up with her snaggletooth to investigate. She’s a detective doggie. And a gossip girl. 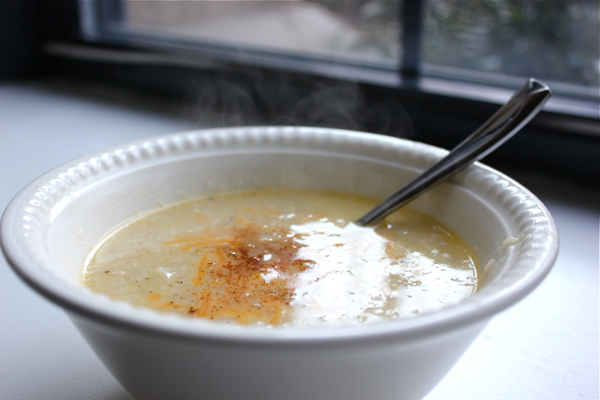 To make this delicious soup, melt 3 tablespoons of butter in a large pot. Add in 1 medium, diced onion (or half of a large onion) and 3 minced garlic cloves. 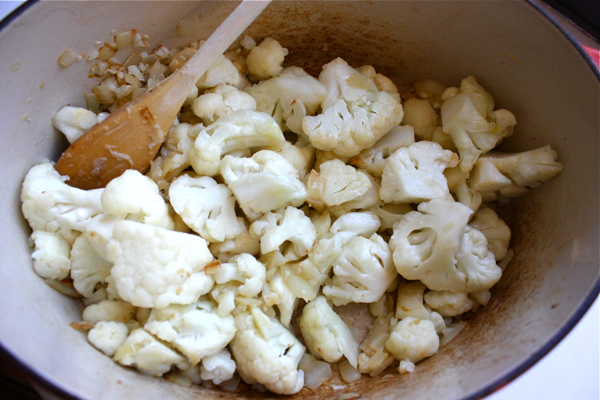 While the onion and garlic soften, chop your cauliflower into medium sized florets, and add them to the pot too. Stir them around and let them cook for about 10 minutes until they start to brown. 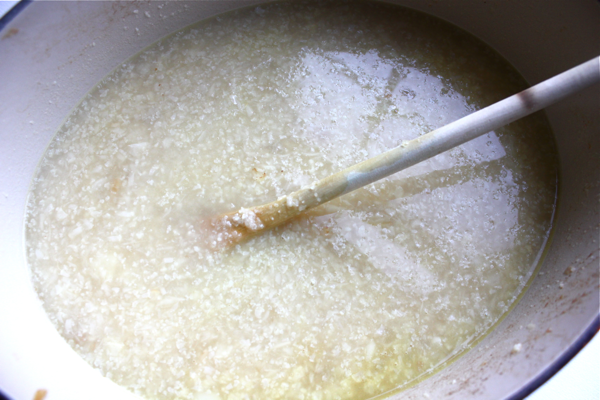 Then, add 1 quart of chicken stock and 1 cup of water to the pot. Bring it to a boil, and let it simmer for 20 minutes. While the soup simmers, grate 1.5 cups of cheddar cheese. When the 20 minutes are up, the cauliflower should be fork tender. It’s time to purée the soup to make it smoother. 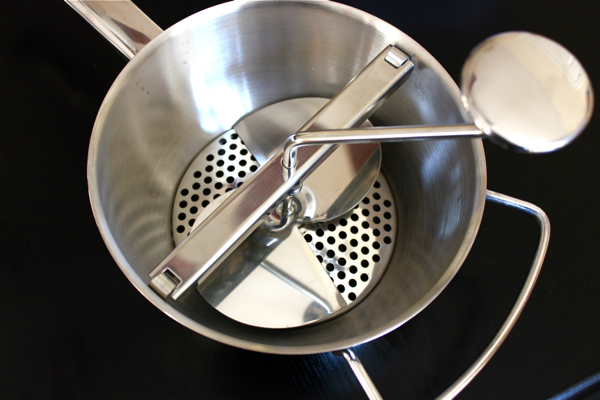 If you have an immersion blender, use that. If not, you can use a regular blender. I passed my cauliflower soup through a food mill because I have neither type of blender, and I like my soups to have a chunkier consistency. Put your soup back into the pot and add in the grated cheddar cheese. Season the soup with salt, pepper, and 1/2 teaspoon of cayenne pepper for an extra kick. I love cayenne pepper! 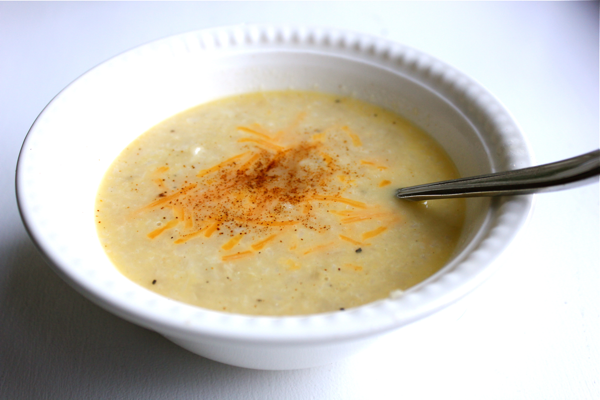 You can serve the soup topped with shredded cheese and a sprinkling of paprika for color. 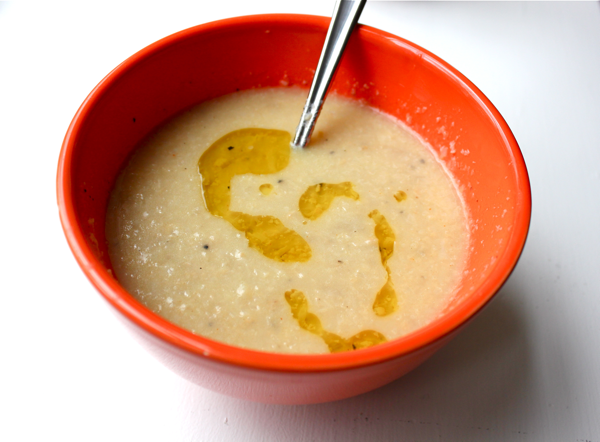 Or for an even simpler presentation, give the soup a drizzling of olive oil. That little bit of oil really ads another dimension of flavor. I love this soup. If you’re not a cauliflower lover, it’s a great tasting way to get all of the veggie’s vitamins and goodness. Does your BEAUTIFUL doggie Stella like cauliflower?? I’m a new subscriber. Am I missisng something??? Love your recipes but have hand-copied two and would love the luxury of printing instead. Is that a possibility? Thanks for the feedback! I just installed a print button that allows you to print recipes with or without the images. I hope this helps. Your recipes are fantastic. I just subscribed.